Keoni Maemori of JHM Productions is a professional propmaster/propbuilder and production designer who has worked on numerous films, television shows, and music videos. He built the Iron Throne prop used in Really Spicy Opera’s 2017 O’ahu Fringe Festival production of Game of Thrones: The Musical. 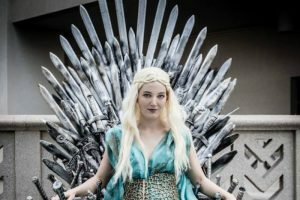 This Iron Throne was previously a star attraction at the 2016 Amazing Hawaii Comic Con, where it was sat on by Stan Lee and served as a photo backdrop for almost 3,000 convention attendees. Maemori currently builds props and manages firearms on set for Hawaii Five-0.